Description: In this lab, you will learn to enable interfaces on a router i.e, configure Serial 0/0 and fastethernet0/0 interfaces on a router with specified IP Address and Subnet Mask. 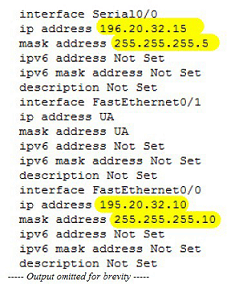 By giving “show running-config” command you can view the ip address configured on the interfaces. 1. Select the device R1 from Select Device drop-down box. Click Configure button, this enables left navigation pane. Click Interface Management > Interface and Connections this displays Interface and Connections screen. 2. In the Create Connection tab select serial 0/0 interface and click Create New Connection button. 3. In the Serial0/0 wizard click next. 4. Choose the encapsulation type for the serial 0/0 interface if needed and click Next. 6. Configure the default routing with optional parameters such as the next hop IP address as per network diagram and click Next. 7. Configuration Summary screen appears click finish button.